The partner of a cyclist who died in a crash involving a lorry said he hopes a "ghost bike" memorial to her will help prevent more deaths. Louise Wright, from Mapperley, died after she was hit by a lorry in Nottingham city centre earlier this month. 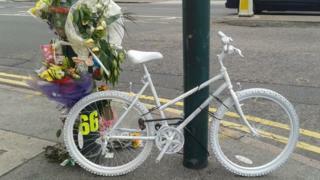 A bike which has been painted white, known as a ghost bike, has been left at the scene along with floral tributes. Her partner James Faulkner said he hoped it would promote cycle safety. Ms Wright, who worked for fashion firm Paul Smith, died on 3 July after the crash involving an HGV in Lower Parliament Street. The ghost bike, thought to be the first in the East Midlands, appeared recently along with tributes to the popular 29-year-old. Mr Faulkner said he and Ms Wright's family had taken comfort from many well-wishers' kind words. "We still don't know the circumstances of the accident yet, but I hope that the ghost bike will help raise awareness of cyclists on the roads," he said. "If it can help prevent any future accidents, then it will have served a purpose and could help save a life." Tributes were also paid to Ms Wright on Facebook, including by the Nottingham Roller Girls roller derby team who described her as beautiful, vibrant and funny. Mike Hallam, duty manager at business Machine Mart next to the crash scene, said some people had reservations about the memorial. "I dare say most people were touched but there were a few mixed reactions, whether it was tasteless or not," he said. "Personally I think it was a very good idea." Leaving a white bike at the scene of a fatal crash started in the United States but has been a growing phenomena across the UK over the last few years.